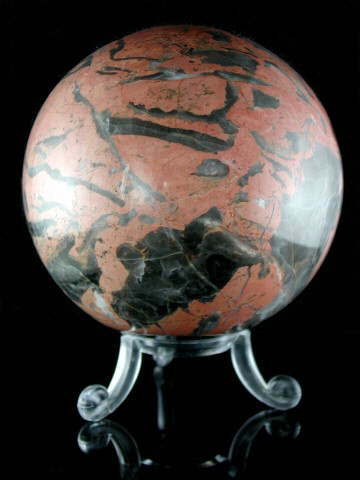 Beautiful, large, quality pink and grey Marble sphere from India. The grey mineral inclusion in this sphere shimmers like silver, so is perhaps Pyrite. This is a really lovely sphere, remeniscent of a celestial body with its gorgeous markings. Marble is a metamorphic rock comprising recrystallised carbonate minerals, like Dolomite and Calcite. The 'recrystallisation' is a natural process caused by intense heat and pressure in the Earth's crust as it cooled over millenia. Marble can be found in many different locations and colours, from pure white - like Parian Marble from Greece, famed for its use in sculpture - to green and pink. The colour depends on other minerals present at the time the Marble formed and the veins are from impurities present such as iron oxides, clay and silica. Its lovely pink colour makes it perfect for all matters related to the heart. Combined with the silver inclusions, this sphere resonates with both the Heart and Crown Chakras. This sphere has a small, flat, polished section on the base so it can either be placed on a flat surface without the need of a stand, or as pictured.